How “Sweet” it is…the Sweet Event that is…. 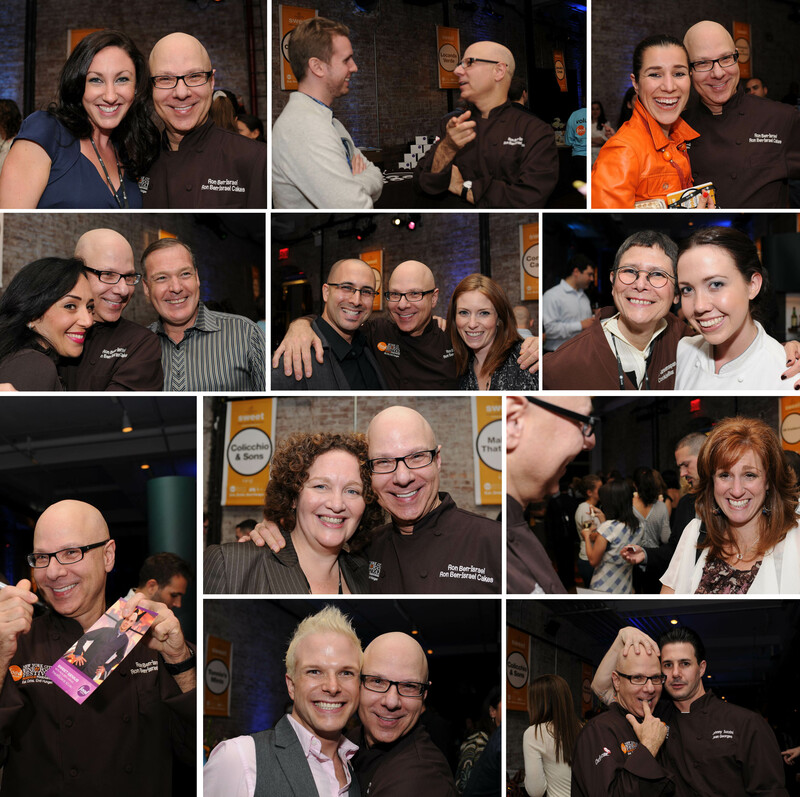 Every year RBI Cakes participates in some really fun tasting events. One of our favorites is the Sweet event. It’s an evening of tasting some of the best desserts pastry chef’s in NYC have to offer. Our good friend Elisa Strauss of Confetti Cakes was right across the way from us. She presented the guests with Godiva White Chocolate Push Pops and impromptu dancing with Ron. L to R: Chef Francois and myself, FPB (Francois Payard Bakery) presented a Roasted Strawberry Tiramisu with a Basil syrup (in the pipette), in the group photo: L to R: Frederic Serol, Francois Payard, Ron Ben-Israel, Rebecca Dorfman & Yvette Hakim. We presented a duo of cakes: Godiva Chocolate Cake with Mascarpone & Salted Pistachio Fillings and Almond Cake with Brown Sugar & Apple Fillings garnished with a Cranberry Orange Compote. (From L to R) MAS (farmhouse) Date Cake with Cinnamon Caramel, Cranberry Compote and Yougurt Mousse JEAN GEORGES Godiva Chocolate & Praline Pop with Cranberry MAD MAC Selection of Macarons ABE & ARTHUR’S French Toast Bread Pudding with Godiva Chocolate Chip Butter Pecan Ice Cream COLICCHIO & SONS Peanut Butter Chocolate Pretzel Tart with Banana Malted Milk PARK AVENUE AUTUMN Aged Goat Cheese Mouse with Caramelized Apples KYOTOFU Pear & Cranberry Anmitsu with Shiro-An Cream. Our interns working hard. Thank you Katie & Jason! Ron was having a fun night meeting up with his favorite colleagues, seeing our clients and meeting fans! On the left I am with Ron and on the right my friend Zac Young who I also like to call my "Pocket Chef". He makes the best donuts! Oh, how absolutely FESTIVE! I just gained 20 kg thinking about all those good desserts. Wish I could have attended! Thanks for sharing. ← Who are “they” to criticize?